Where out story left off, a Victorian dandy/scientist and distiller created an unctuous, vivacious liquid which was all the rage in late 19th century London. “Juniper, Cardamom and Citrus melting together in perfect harmony.” I can’t quite tell if the backstory is a bit tongue in cheek, an anachronism riddled back story to poke fun at the genre, or if this really is Sir Raleigh Holmes-Dunston’s 1892 creation, resurrected [most certainly by hand powered robots capable of passing a Turing test, held back merely by their crude source of power] and re-created. In any case, Steam Punk Gin boasts “seven peculiar botanicals from around the world for a distinctive taste.” [and here I thought that the word Peculiar in conjunction with gin might have been trademarked by the Edwardian marketing wunderkinds over at Hendrick’s. Pleasantly spicy on the nose, cardamom and angelica with a solid juniper qua gin base to it. Quite classic, there’s some definite citrus in there as well and with bits of coriander as well. Despite the boast of “7 peculiar” I’m not getting much of anything out of the ordinary on here, I’m detecting a lot of traditional notes. Certainly, not a bad thing. Steam Punk Gin is very crisp and has quite a nice palate. First, there’s a hint of something a bit unusual on the first sip, perhaps a tinge of lavender? Citrus, with a mostly orange, leaning bitter orange towards the finish. A slight creamy texture to it as well, strong classic juniper backbone, and a heavier hit of coriander, though very clean and direct in its expression, perfectly melded with the vivid angelica notes. 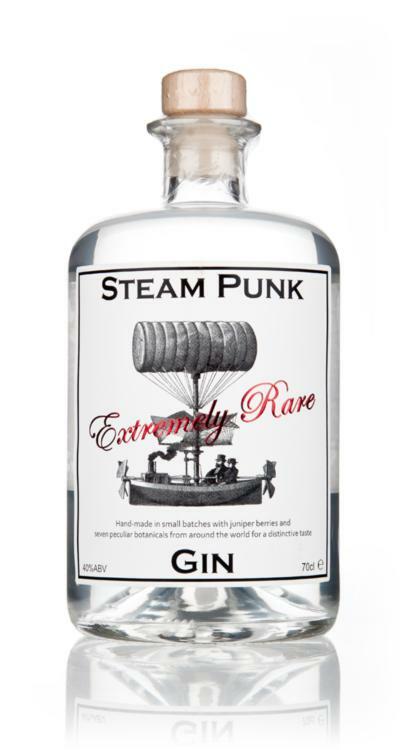 The finish of Steam Punk Gin is a bit sharp with a good deal of astringency, finishing in quite a classic way. I mean, it’s a really solid, bright, classic style gin. It does a lot of things well. When I contrast it with the evocative and in-your-face affront to tradition that the Corsair’s Steam Punk Gin (not reviewed on her yet, but its smoky, peppery, complex with a strong campfire/cookout vibe) this feels like the kind of gin that you don’t need to be looking for something unusual to enjoy. And to be honest? at this price point, it’s a bargain for the level of quality too. Although I won’t bump up the rating based on expectation/price, I think it’s worth pointing out that if you find Steam Punk Gin at the price I found, it’s a good deal for what it does. Hi, I have tried to get this gin everywhere at the price you quoted, but I can’t find it below the £30 mark. Please let me know where I can buy it for that, coz I know it is massive in the north east of England. Yeah, but where can I get it for £25 coz that would be a real bargain! Charlie your a right Charlie aren’t you. Have you told people you have a vested interest in this Gin. Try Hendrick’s much better and not as dry as steam punk. Highly disappointing. It lacks the subtlety of flavours I would expect from a craft distilled product. Try Poetic License’s Northern Dry Gin, or Durham Gin – far superior.